Many houseplants, annual plants, and fruit trees exhibit a phenomenon in which the terminal bud produces hormones inhibiting the growth of axillary buds. This allows the plant to grow taller, increasing its exposure to light. Under certain conditions, the axillary buds begin to grow, producing branches. This can occur when the terminal bud is pruned (“pinched back”) on certain plants and fruit trees, stimulating the axillary bud growth and producing bushy, full-looking plants. Leaves are the main photosynthetic organ for plants; they are also organized to maximize sugar production while making sure little water loss occurs. Thus, they are also important in gas exchange and water movement throughout the whole plant. Leaves—outgrowths of the shoot tips—are found in a variety of shapes, sizes, and arrangements. Most leaves have a blade (the flattened portion of the leaf), a petiole (the slender stalk of the leaf), and leaflike stipules (found on some leaves and located at the base of the petiole where it joins the stem). Cross-sections of a leaf also show a variety of features, including the cuticle (the outer covering to minimize water loss), veins (also called vascular bundles, which carry water and nutrients from the soil to the leaf and also carry sugar), stoma (plural stomata; water escapes through the stoma; they open and close), guard cells (modified epidermal cells that contain chloroplasts and control the opening of the stoma), and palisade and spongy mesophyll cells (for photosynthesis). 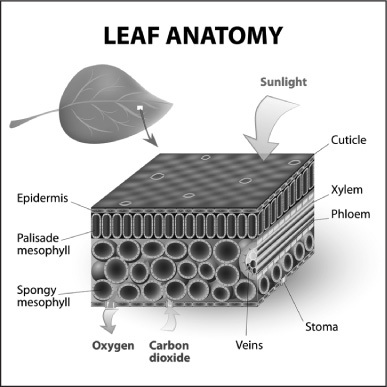 A cutaway of a typical leaf shows its interior structure.